Dentists regularly remind all of us to brush regularly and correctly, but it becomes even more important when wearing a brace. Manual or electric, you need to brush at least twice a day – ideally three times a day when wearing a brace. As good as the results are with a manual, electric toothbrushes have a whole array of benefits. If you want to take advantage of these benefits, which is the best electric toothbrush for braces? As we explain in our buyer’s guide below, whilst you do not have to, the best choice is to go for a brush from one of the market leaders, be that Sonicare or Oral-B. We’ve reviewed many of the brushes from these manufacturers, and it’s safe to say they make fine brushes. Here are our top 5 electric toothbrushes for braces and why we chose each. Short review: Available in an array of colours the DiamondClean is a smart and sophisticated looking brush with a very minimalist design. Sadly whilst the minimal design looks the part, it lacks some of the comfortable gripping points that are designed into other brush handles. We will let this slide a little given this brush offers 5 different cleaning modes, which illuminate when activated on the slim brush handle. A toothbrush will likely last longer than your brace, so you want a brush that really can show off your smile when the brace comes off and the DiamondClean helps achieve just this. Nice additions are a travel case, that is stylish and rigid and holds a handle and up to 2 brush heads. You will look super sophisticated with this in any hotel bathroom or if you even have to whip it out in the work loo’s on your lunch break. You can even charge the brush in the case using the supplied USB to microUSB cable. The detachable cable can be easily lost and is not a more current microUSB or USB Type-C, not that you should have to charge all that often with a 3 week battery life. Important is that the toothbrush cleans the teeth well. The sonic cleaning action really works its magic and is soft on the teeth and gums and the brush is nice and quiet too. It comes provided with an AdaptiveClean brush head (a few extras would not have gone a miss) and we really like the fact that the built in timer turns the brush off at the end of a 2 minute clean. There is no pressure sensor or Bluetooth connectivity, this is reserved for the DiamondClean Smart. Read our full Sonicare DiamondClean Review. Short review: It’s Oral-B’s flagship electric toothbrush and it is apparent from all that you get and what it does that this brush is not exactly your bog standard £5 throwaway job. A little more practical in its design and look than our winner, the Genius 9000 has extensive rubber grips on the rear of the brush handle that comes in White, Black, Silver, Rose Gold, Orchid Purple and Midnight Black. The different colour options allow you to have something that suits your personality a little and further personalisation comes via selecting 1 of 12 colours to light up the SmartRing on the neck of the brush handle. Doubling up as the visible pressure sensor, this SmartRing illuminates Red when too much pressure is applied to the teeth during brushing, alerting you to this. The brush had a built in timer and pacer as well as having Bluetooth connectivity. On the whole the app works really well and can be worth investing some time into learning and perfecting use of it. However time and effort is required. You are going to have to put in effort when cleaning round a brace, but the enhanced position detection system is a bit of a faff when you have to mount the phone in a smartphone holder on your mirror, even if clever. When it first launched the 12 day battery life was much better than the more average 7 days from most of their other models, but is not a little sub par when considering all the options available now. A smart travel case it works well and is similar in the concept to the DiamondClean in that it holds the brush and up to 2 heads and can be charged in the case. However, the proprietary connector puts a but of a downer on this. The small round brush heads provide a fantastic clean and with 6 different modes available on this brush you are set for every eventuality. The modes light up on the brush handle, but only 5 of the 6, not the default Daily Clean mode. Multiple brush heads supplied, but not the specialised Ortho head, you will need to purchase that separately. A clever brush from a leading brand that has a lot to offer. Read our full Oral-B Genius 9000 Review. Short review: It lacks the weighty price tag of our previous two recommendations and is perhaps the ‘best’ when you consider features for the price. A lovely slim handled unit, this brush offers almost all you could want, but the bits it misses out on are the expensive features. It does not have Bluetooth and it cannot be charged in its travel case. But it does have a built in pacer and timer, a pressure sensor, come with a powerful brush motor a travel case, a slim handle and 2 week battery life. It is available in a lesser number of colours than some other models, but the Black/White and the Pink/White options should suffice for most. The travel case is basic but functional holding the handle and up to 2 brush heads. It comes with either a CrossAction or 3D White brush head (subject to colour option) so you may want to invest in some spares or extras. This is an excellent brush if you are on a budget or simply can’t see worth in some of the extra features of the other brushes mentioned. Short review: The brush that fulfils the least of the criteria on our desirable features list, but one we felt compelled to include. It is one of Sonicare’s cheaper brushes, but despite being more cost effective it is still relatively pricey at around £40 when compared to the competition that appear to offer more. Suitable for braces as soon as it is out of the box, the Sonicare cleans well. It is reassuringly well built in the hand, the quality shines through. The brush is quieter than Oral-B counterparts and offers a fantastic 3 weeks of battery life. 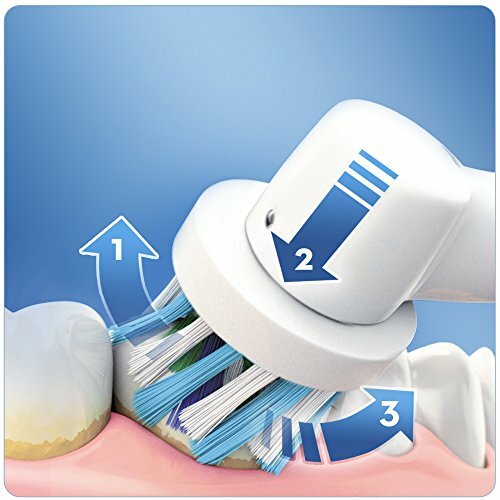 Power is conserved via an automatic power off feature and users are guided to brushing correctly via the built in timer and Easy-Start mode which eases first time users into the power of the brush. No travel case, no bluetooth, no pressure sensor, this brush is simple but effective and is ideally suited to those who want quality from a trusted brand. 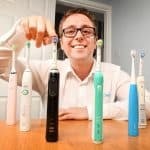 Short review: Quite frankly this is the best electric toothbrush you could have for cleaning your teeth, in our opinion. But there is a problem – price. Whilst we appreciate innovation comes at a cost, at around £360 this brush is ridiculously expensive in comparison to the other options available, when considering the actual selling price rather than RRP. We love this brush and it would be our number 1 choice if it was not for the cost. If money is not an issue and you want the ultimate, go for it, but for the vast majority, you can come away with a lot more money left in your wallet if you opt for the other recommendations. Even if you do have the funds, it would have been nice to have a few extra brush heads in the box. The brush cleans superbly and is essentially an evolution of our top recommendation. The DiamondClean Smart has 5 cleaning modes, can automatically detect the brush head fitted and change the mode to best suit that head. Bluetooth connectivity and a pressure sensor are to built in, offering up features seen on the Genius 9000, but missing from the original DiamondClean. The battery life is top notch at 3 weeks and the travel case is now even better than the DIamondClean, with the USB cable being wired in, rather than detachable. Why is Brushing and Flossing so Important for Braces? Thorough cleaning is especially important for people undergoing orthodontic treatment as the brace wires can catch on food and encourage the accumulation of plaque. Braces can make you susceptible to a range of conditions such as gum disease, tooth decay and halitosis. Brushing and flossing should take place after every meal, ideally 45-60 minutes after eating. Don’t worry if you don’t brush after every meal, but try and form a routine if you can. When wearing braces, you increase the amount of surface available for bacteria and plaque to stick to. You also increase the number of places food can get stuck. Sadly, more plaque means that you are at higher risk of decay. Even though very early stages are reversed, meaning you do not need fillings, you could be left with white marks on your teeth when the braces are removed, if you have not been cleaning well enough. By brushing regularly you reduce the chances of staining or other oral health issues. Even when you do not wear a brace, some 35-40% of the tooth surface is missed with regular brushing. This is why flossing is advised, in reaches in those tight gaps between teeth, cleaning the areas normal brushing simply has not reached. This is not the easiest when you have braces. Although the best approach, water flossers are a much easier product to use and can save a lot of time and effort. Take a look at our best water flossers for braces article, as one of these could be a great accompanying product to an electric toothbrush. If by wearing a brace you are more susceptible to plaque formation, gum disease and poorer oral health, it seems only logical to take advantage of the electric toothbrush which has been proven to offer significant benefits over a manual brush. Up to 100% more plaque removal is the claim many of the electric toothbrush manufacturers. 100% improvement is pretty significant and perhaps a little hard to believe. Studies of theirs have found such to be true, but a perhaps fairer, yet still incredibly impressive result is the 21% less plaque after 3 months use research group Cochrane found from their research. Leading brands Sonicare and Oral-B have products suitable for those with braces, but how do their brushes work and compare when it comes to cleaning a brace. Is there such a thing as an ‘orthodontic electric toothbrush’? If you’re a braces wearer, something else you may be wondering is whether there is an electric toothbrush specifically for braces, an ‘orthodontic electric toothbrush’, if you will. The answer is; no, not exactly. 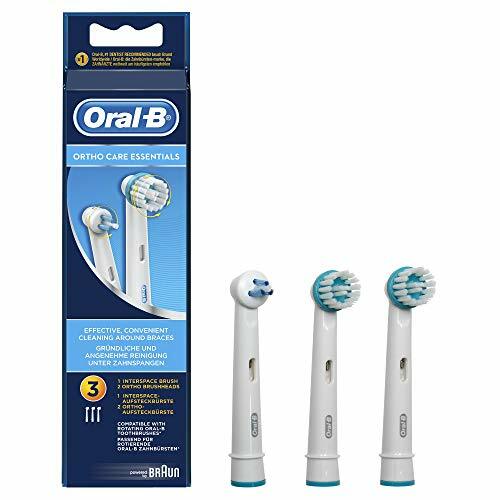 However, Oral-B does make a brush head for braces — the Ortho head (view it here on Amazon) — which we talk about in more detail below, and both Oral-B and Sonicare offer electric toothbrushes that are perfectly suitable for use with braces. Read on to find out more about each. Sonicare produce and excellent array of brushes and it is their DiamondClean that is our chosen brush when it comes to cleaning your teeth whilst wearing a brace. Out of the box, the included heads just work and you need not adapt your brushing style. The following video shows a Sonicare brush in action and how you should clean your teeth. Just like Sonicare, Oral-B brushes work out of the box with braces, although it should be noted that the 3D White and FlossAction brush heads supplied with some models or sold separately should not be used with braces. Their smaller round brush heads are the preference for some and can certainly be a little easier to get in smaller, hard to reach areas. Unlike Sonicare, though, they do offer a specialist brush head. You do not have to use it, but it has been specifically designed to achieve the best results when used on a brace. It is called the Ortho brush head – view it here on Amazon. Inner bristles focus on the brace attachment to the tooth whilst outer bristles focus on the exposed tooth surface, the gumline and in between teeth. Just £10 could get you an electric toothbrush that in principle is capable of cleaning your teeth and braces fairly well, but spending more and taking a more planned approach to your decision would be better. As a general rule the more you spend the better the brushes features and how well it cleans, but there comes a point when you get a diminishing return, so it is not just about spending the most. We have put together a comprehensive guide to the best electric toothbrush that explains all the different features of an electric toothbrush and what you need consider, but to save you reading all of that, here is a summary of the important features we feel you need consider when choosing an electric toothbrush to be used with braces. Most of the standard brush heads provided with an electric toothbrush will work with braces. Oral-B’s 3D White and FlossAction are exceptions to this rule. Oral-B have a specialised brush head, the ortho head, which is designed to clean effectively around dental fittings. It is optional whether you use this, if you opt for an Oral-B brush but one to bear in mind. This is really a must of any electric toothbrush but with a brace it is of the uppermost importance to brush for the right amount of time. A timer and pacer, sometimes known as a quadpacer, will guide you through cleaning the sections of the mouth for an equal amount of time for a balanced clean. Too many people brush their teeth too hard. Bristles need only skim the surface of the teeth. The result over time can be gum recession, but with a brace this can mean damage to the fixings and wires so carefully placed. Those brushes with a pressure sensor built in will alert you when brushing too hard, to allow you to resolve the issue, keep your mouth in the best condition possible and avoid unnecessary trips for repairs to a brace. As it is best to brush more regularly when wearing a brace, it is likely you will need to take you brush with you more frequently, be this to work, to school, to a friends house or simply out and about. A travel case can really assist in not only protecting the brush handle and heads when being carried around but avoid accidental activation too. Some cases are better than others, with some allowing the brush to be charged in the case, but most offer basic protection and storage for up to 2 heads. Often overlooked or not seen as all that important, as generally left on the charging stand when not in use, for those with a brace, the situation is a bit different. You might find you are brushing more regularly or for longer, thus the advertised battery life is more important, because the increased use means less time between charges. Most electric toothbrushes now come with a 2 week battery life based on 2 cleans per day lasting 2 minutes. However, there are still some that are shorter or conversely much longer than this. Clean your teeth 3 times a day and a 2 week battery life soon drops to about 10 days rather than 14. Certainly not a must have, but if investing in a new electric toothbrush, something to consider perhaps. The Bluetooth connectivity and the supporting apps allow you to log your clean, set target areas and much much more. The app’s primary goal is to educate and encourage better cleaning and is a little like having a dentist watching over your clean. If you are going to spend more time cleaning your teeth, best to do it right?! Not all brushes offer all of these features but many offer a number of them. We will highlight where features are missing in our explanations of the selected brushes below. 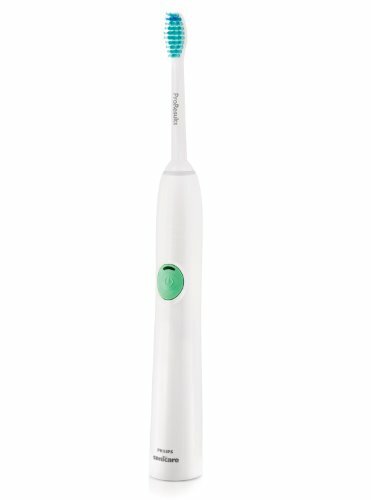 Do you use an electric toothbrush with brace? If so, what tips and tricks can you share? If you are a braces wearer and you’re thinking of buying a brush, let us know if you’ve got any questions by leaving a comment below. I also use the most powerful cordless water flosser, and still finding it hard to keep my teeth as clean as I would like them to be, they look discourored around the base of each tooth. My question to you is.. which gives a more superior clean around the braces, Sonicare diamond clean vs oral b’s orthodontic head? Would love a comparison of these 2 in particular. I do not have nor know of any clinical studies that really compare these brush heads in a way that can provide meaningful results and explanation as to which is better. Everyone can have an opinion, but you want the hard facts, which sadly we are not in a position to offer. Both Sonicare and Oral-B do a lot of research and these products would not really exist and be as popular as they are if they did not work. You might not feel that the brush is cleaning as well as you would like, but it probably is doing a very good job. I am presuming you have fixed braces based on what you say and I am also presuming you have regular checkups with your orthodontist. Normally they would tell you if you are not cleaning well enough, but at your next visit, do ask as they can make an assessment there and then and tell you if you are indeed brushing to the standards needing to maintain good oral health. I suspect you are. As for the tooth looking discoloured, this is most likely down to the light and the way it reflects on the tooth, rather than actual discoloration. Do consider that if wearing metal braces, the top of the tooth is in the shadow of the brace and the dark metals will adjust the way light shines and potentially make it look darker. Just wanted your view on the comparison of these two as it seems like you have provided a lot of good advice on Your article and I was looking to purchase a different brush. Thank for the reply tho. I don’t wear braces. I did previously (prior to founding the site) so can’t give current and accurate first hand opinion. I have no reason to believe that the additional bristles or shape of the Sonicare head will be better for you, so I can’t really suggest changing brushes would be worthwhile. Oral-B actually comes out top in the clinical tests for normal teeth brushing. Hi can I use the Oral-B Trizone 600 electric brush with fixed Braces please. Yes you can. We would advise trying the Oral-B Oral Care Essentials brush heads though. I just had my braces fitted today (Damon) and I never used an electric toothbrush before. I find some toothbrushes a bit expensive and I’m not sure what to do or buy. Should I continue with manual or buy electric? Even the manual flossing looks like hard work and I’m thinking to buy the air flosser. Adina, thanks for the comment. The decision is personal, you don’t need to spend a fortune on an electric toothbrush, but you could continue to use a manual brush. I think you will find electric easier. 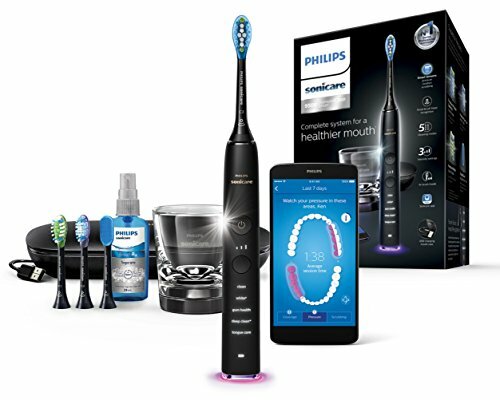 As a more cost effective option that what is mentioned in the article, you could look at the Oral-B Pro 2000 and then purchase the Oral-B Ortho brush heads to go with it. This will set you back around £30-£40. Which is a lot less than some options. An air flosser is a great option when you have braces, but I would also consider using inter-dental brushes too. It is essential to make sure you are doing all you can to clean your teeth properly when wearing braces to avoid any issue later. 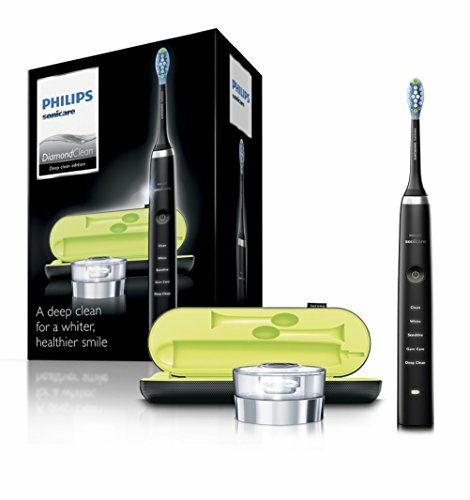 I’ve just bought the Phillips Sonicare Airfloss Pro. I fitted my braces last weekend and it hurts when I floss. After having a good read on your website I decided to go for Phillips. Looks easier to use and doesn’t require much space and is kind of cordless. Once I get used to having braces I’ll go for what you have reccomended. Once you have used the Airfloss Pro, please do let me know what you think of it. Always great to have other peoples feedback. The Phillips AirFloss Pro is really pro. Easy to use, the baterry lasts forever and now after having the top braces on is even harder to brush and the flosser gives me a better clean feel and my ortho said it’s a good investment. 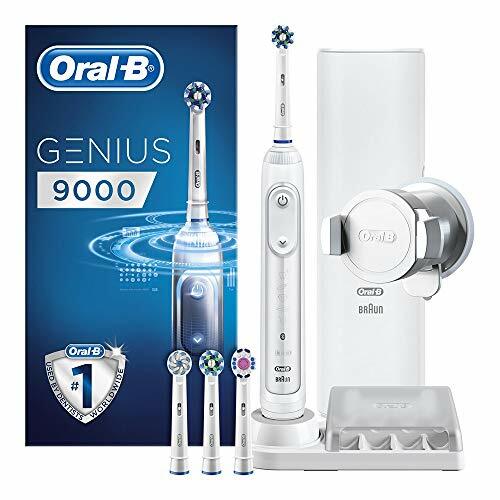 At the “Best Electric Toothbrush For Braces” section, you mention that “for an affordable brush with a sensitive cleaning mode, consider The Oral-B Pro 2000 […] The sensitive setting provides the perfect clean for anyone suffering from brace pain. ” I am a bit confused as I know that Pro 2000 has only 2 cleaning modes: Daily Clean and Gum Care. Starting from Oral-B Pro 3000, the 3rd cleaning mode: sensitive is added. Please confirm if Pro 2000 is ok to be used for braces. Hi Cristina, You are right, this is an error on our part. We will have this updated. The 2000 can be used with braces, no problem. Might want to consider the Ortho head.